One of the many questions that fans have about Star Wars: The Last Jedi is what role will Maz Kanata play in the new film. 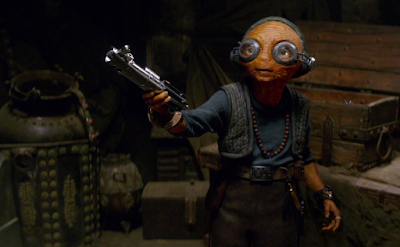 Maz was a key player in The Force Awakens, giving Rey her first significant lesson in the Force. However, now that Rey will be training with Luke, the question is what is Maz's part in the story of the new film. We know that Maz is definitely back, director Rian Johnson spoke briefly about working with Lupita Nyong'o in the recent Entertainment Weekly story, but did state that her role in the film is smaller than her role in The Force Awakens. Now, our friends over at MakingStarWars.net have a new report about what Maz will do in The Last Jedi. They heard from a source who got to participate early in the Find the Force program that Lucasfilm is rolling out for "Force Friday II" next week, and they learned what Maz will be doing in the new film. Seeing as this will likely be public knowledge in about a week's time when Find the Force is available for everyone it's hard to call it a major spoiler. But if you are trying to avoid knowing anything about The Last Jedi, this is your SPOILER ALERT! Apparently, Maz will introduce the Resistance to DJ (they mysterious slicer/hacker character played by Benicio Del Toro). According to MSW, "She helps the Resistance by pointing them toward a 'mysterious new ally'. Maz has been forced to become more mobile and take more of a role in the criminal underworld." It's interesting that The Last Jedi is embracing more of Maz's "underworld" side, rather than her mystical side. Which makes a lot of sense. Now that Luke Skywalker is teaching Rey the ways of the Force, Maz's role has to shift from what it was in The Force Awakens. And, given that Maz is 1000 years old, she clearly has some significant connections throughout the galaxy.